A Bar at the Folies Bergere (1881-2) By Edouard Manet. One of the greatest modern paintings of the 19th century. Edouard Manet was a highly contradictory figure. On the one hand he was a very innovative painter, whose groundbreaking works - Dejeuner sur L'Herbe (1863) and Olympia (1863) - heralded the arrival of modern art while scandalizing critics and public alike. In addition, he was associated with the avant-garde art of the Impressionist painters, becoming a figure of admiration for younger painters like Monet (1840-1926) and Renoir (1841-1919). On the other hand, however, he remained a fundamentally conservative artist and individual. The son of a senior official in the French Justice Ministry, he was a great admirer of the Old Masters - notably the schools of Spanish painting and Venetian painting - and respected the traditions of academic art championed by the official Salon. Even his most notorious works were modelled on the great classical masterpieces: Dejeuner sur L'Herbe was based on Fete Champetre (1509) by Giorgione; Olympia on Titian's Venus of Urbino (1538); Execution of Emperor Maximilian (1867) on Goya's The Third of May, 1808 (1814). And while it is true to say that he adopted some of the painterly characteristics of Impressionism - see, for instance his seemingly spontaneous masterpiece The Road-Menders, Rue de Berne (1878) - he never exhibited at any of the Impressionist Exhibitions in Paris (1874-83). His greatest artistic ambition - sadly unrealized at his death - was to be elected a member of the French Academy. NOTE: For the story behind "Impressionism" and the group of French painters behind it, please see our 10-part series, beginning: Impressionism: Origins, Influences. This picture, painted when Manet was terminally ill, maintains the artist's contradictory outlook. On the one hand, it features a modern setting in The Folies-Bergere - the most famous and modern of Paris's cafe-concert halls, which was noted among other things for its new-fangled electric lights. In addition, its brushwork is Impressionistic and its framing has been influenced by the new art of photography. On the other hand, its meaning is totally obscure, even baffling, dealing as it does with a problem that occupied Manet throughout his working life: the relationship, in figurative painting, between reality and illusion. Probably modelled on Las Meninas (1656), the enigmatic Baroque masterpiece by Velazquez, the picture seems to be a straightforward frontal image of a barmaid serving behind her marble-topped counter, who looks out at us, the viewer/customer. Then we notice the huge mirror behind her and the confusing reflections it contains. The barmaid's reflection has been shunted to the right; while in the top-right corner we see a ghostly image of a man who appears to be directly in front of her, and whom she is leaning forward enthusiastically to serve. A huge amount of analysis has been devoted to this work by art critics and historians, in an attempt to decipher its meaning, and reconcile the apparent dislocation between the actual reality of the barmaid and her counter, and the surreal reflections in the mirror. There has been much discussion about "artificial space", the "spectral domain of the mirror", the "discontinuities between actual and reflective realms", and so on. Luckily, Dr. Malcolm Park, an art historian in Australia, appears to have unravelled at least part of the mystery, in his doctoral dissertation entitled, "Ambiguity, and the Engagement of Spatial Illusion Within the Surface of Manet's Paintings" (University of NSW, 2001). Using a photographic reconstruction, Park demonstrates that the painting conforms more truthfully than previously thought to a one-point perspective view. Manet actually constructed the scene not from a frontal head-on position, but from a viewpoint slightly to the right. Seen from this angle, the assumed 'conversation' between the barmaid and top-hatted gentleman is actually an optical trick - the man in fact is standing outside and to the left of the new viewpoint, and is looking away away from the barmaid - he is not standing directly in front of her, facing her. Likewise, the barmaid's frontality is also optically deceptive. Instead of standing parallel to the bar and looking straight ahead, she is facing slightly to the right of the picture as we see it, facing the new viewpoint. Malcolm Park's research demonstrates that Manet was not trying to manufacture an illusion in the mirror but simply portraying reality. The illusion, so to speak, stems from his pretending to paint the barmaid head-on, rather than from an angle off to the right. Although smaller than Renoir's Dance at the Moulin de la Galette (1876), its hieratic composition and single life-sized figure give it a monumentality that separates it from the consciously informal Impressionist practice of Renoir. Although the background reflections of the cafe-concert hall were painted from memory, each element on Manet's bar-altar is deliberately placed, and the barmaid, who looks through us into the space reflected in the mirror behind her, has all the status of a priestess. Manet was not well enough to paint this work in the Folies-Bergere itself. Instead he painted it in his studio where he had a dummy bar counter installed. For other figurative works by Manet, see: Portrait of Emile Zola (1868); The Balcony (1868) and Portrait of Berthe Morisot (1872). The bottles, fruit and vase of flowers arranged on the counter are replicated with all the precision of a still life painting, as well as the symbolism of a Dutch Realist vanitas painting, in which the transience of life is a major feature. The oranges, for instance - are they an illusion to the inevitable decay and death of human life (Manet was dying, after all), or do they symbolize prostitution (as in other works by the artist)? The bottles of English beer - Bass Pale Ale - may represent the temporary pleasures of the flesh, but their conspicuous presence on the counter (instead of the more usual German beer) may also allude to Manet's anti-German feelings in the wake of the Franco-Prussian War (1871). The woman behind the bar is believed to represent one of the prostitutes - another pleasure of the flesh for which the cafe-concert hall was well-known - although she is actually a real person, known as Suzon, who worked at the cafe-concert hall during the early 1880s. Manet painted her in his studio. Meanwhile the model for the mysterious gentleman, top-right, was Manet's neighbour the military painter Henry Dupray (1841-1909). Other noteworthy touches include: the legs of the trapeze artist which appear in the top-left corner of the picture; Manet's signature, which appears on the wine bottle, bottom left; and three of Manet's friends - Gaston Latouche, Mery Laurent and Jeanne de Marsy - who are all identifiable among the blurred images in the mirror. Although much of the content of this masterpiece appears to be resolved, its ultimate meaning remains obscure. Was this picture Manet's last attempt to produce the ultimate modern 'history painting' to secure his membership of the Academy? Did Manet intend the Folies-Bergere to represent Paradise, or a dangerous den of iniquity, or merely a popular setting? And who or what does the barmaid represent? Is she a beguiling Venus-like figure or a fallen individual and a lesson to us all. Then again, Manet was dying of syphilis, so was this picture a final reminder of the pleasures that were about to take his life? 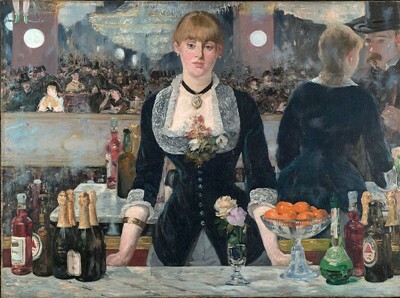 A Bar at the Folies Bergere was exhibited at the Paris Salon in 1882, the year before Manet's death.  The Ballet Class (1871-4) by Degas.  Poppy Field (Argenteuil) (1873) by Claude Monet.  Absinthe (1876) by Degas.  Gare Sainte-Lazare (1877) by Claude Monet.  Luncheon Of the Boating Party (1880-1) by Renoir.  For the meaning of other Impressionist paintings, see: Homepage.